Flag of North Carolina; photo by Alisha Newton on Flickr (noncommercial use permitted with attribution / no derivative works). "(The flag) ... shall consist of a red field with a white star in the centre, and with the inscription, above the star, in a semi-circular form, of "May 20th, 1775," and below the star, in a semi-circular form, of "May 20th, 1861." That there shall be two bars of equal width, and the length of the field shall be equal to the bar, the width of the field being equal to both bars: the first bar shall be blue, and second shall be white: and the length of the flag shall be one-third more than its width." SEC. 1. 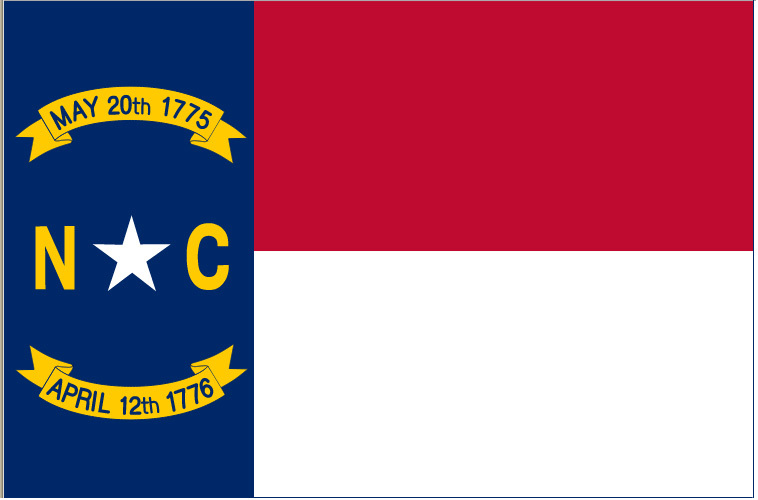 That the flag of North Carolina shall consist of a blue union, containing in the centre thereof a white star with the letter N in gilt on the left and the letter C in gilt on the right of said star, the circle containing the same to be one-third the width of the union. SEC. 3. That above the star in the centre of the union there shall be a gilt scroll in semi-circular form, containing in black letters this inscription "May 20th, 1775," and that below the star there shall be similar scroll containing in black letters the inscription: "April 12th, 1776." The date May 20, 1775 refers to the Mecklenburg Declaration of Independence (though historians debate the authenticity of this document and so many North Carolinians question the legitimacy of having this date on the state flag). 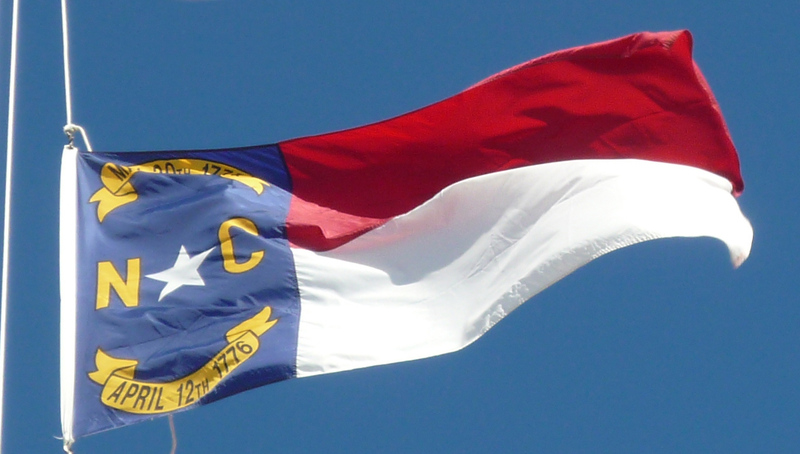 The May 20th, 1861 date commemorated North Carolina's secession from the Union. This second date was replaced in 1885 with "April 12th, 1776." to commemorate the Halifax Resolves, a document that places North Carolina in the front rank among those that demanded unconditional freedom and absolute independence from any foreign power (considered a great landmarks in the annals of North Carolina history). This flag remained unchanged for over 100 years until 1991 when minor changes were made (commas were removed from the dates and the total length of the flag was changed to "one-half more than the width." North Carolina's state flag; public domain image on Wikipedia.